CEPIMA is a Research group of the Department of Chemical Engineering of the Universitat Politècnica de Catalunya, working in the area of computer modelling and optimisation of Chemical Processes (CPI), including the application and development of artificial intelligence supporting techniques and software. The CEPIMA research group has grown steadily and presently consists of 5 full-time lecturers and 22 full-time researchers. There are 15 PhD Thesis underway related to kinetics, process design and operation, with a substantial number of publications in reputed international journals (over 100 publications in the last 5 years). The group has participated in 28 projects funded by CE (JOULE, ESPRIT and Brite), twelve national projects (CAICYT, CICYT and CIRIT),two US-Spain collaborative projects and over 40 other projects funded by private industry. Special emphasis is given to the development of methodologies and tools for plant redesign, retrofit scheduling, production planning (including web agent-based planning), and on-line control in the areas of multipurpose batch, semi-continuous and continuous operation, particularly in relation with the use of computers to achieve this function. In the concourse of those activities several softwares have been developed and are currently used in several industrial sites in Spain, France and Germany. Special effort has been also made to the development of open modular software easy to integrate with other commercial products and databases and communication structures for on-line control. In this sense, and given its experience related to industrial applications, UPC-TQG is presently involved in more than ten research line. The "Center for Process and Environmental Engineering" (CEPIMA) works as a research group for over 20 years, initially as a result of coordinated action of the UPC Research Group on "Chemical Technology" and the UPC "Environment Center" Laboratory. Their research, development, innovation and technology transfer aims to generate analysis and management improvement of productive resources in the process industry , using the term "resource" in its broadest sense: anything that is necessary for the proper functioning of the process. Emphasizing on the convenience (need) to integrate the management of environmental resources with other resources to manage the process to obtain tradeoffs for management decisions, with mixed effects. With a determinant weight in the aspects of interaction with the environment (emissions, resource consumption, etc..), to obtain new resources in a particularly efficient way. Changing the point of view, to focus on assessing how the process affects the environmental quality of their environment, and thus minimizing this effect. Whichever point of view, a systematic analysis, a quantitative assessment and, in general, the application of the principles currently underlying any management system (quality, environmental risk) is required. However, the definition of indicators to quantitatively assess the efficiency and / or effectiveness of the overall management of resources is not clear, particularly when the term "improvement" often involves a subjective assessment of different factors that often conflict, and among which include elements without a clear market value (eg., environmental resources). The formulation of indicators based on combinations (linear or more complex) of the individual assessments of the different terms may allow an intuitive interpretation of the problem (the weight assigned to each element within this process is a reflection of the way specific organization has to understand the "sustainability"), but its implementation is constrained to a specific environment. The need for assessing how the alternatives will be applicable across a broad spectrum of situations leads to a multiobjective approach for the management of resources, where the solution is not necessarily unique and open, therefore, an additional dimension to the problem. The "resources" to handle can be of many types, is that "manage" all, and the degrees of freedom available to do so may be different in each case. This justifies the existence and implementation of specialized solutions for specific aspects of problem solving generic decision-making. Although part of this way of identifying and characterizing the problems, CEPIMA wants to stress the integration of solutions for the exploitation of common conceptual elements that present different aspects initially identified as specific. Finally, the resources management must cover ever wider systems in the line marked by the current social and economic changes. Globalization is demanding efficiency at the level of the supply network, looking at the efficiency of process as a "local optimum" and therefore theoretically better. 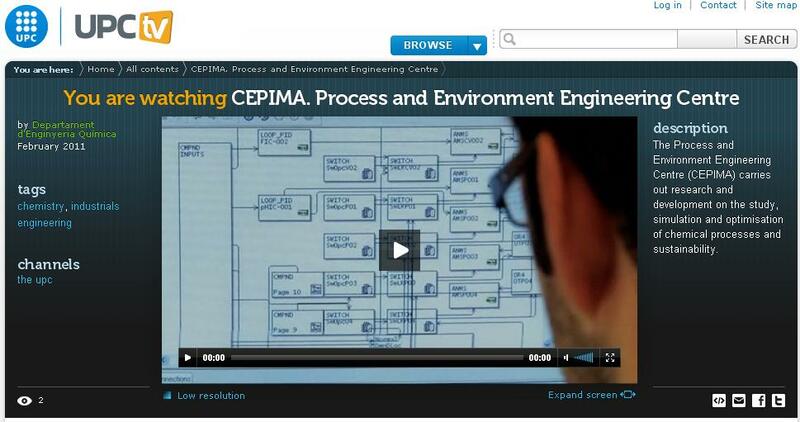 CEPIMA been guided by both their systematic development tasks and tools to ensure that during any decision making related to the different parts of the life cycle of a system (and specifically, a "process industry") are valued properly available resources (material, financial, human, energy, environmental ,...), to analyze and rationalize (optimize) jointly use. Line 1: Integration and intensification of processes. This is the line with more weight in the group, both in regard to individuals involved and with regard to developing research projects, doctoral theses, etc. in recent years. Line 2: Management and recovery of waste. It has been possible to start new research lines like modeling odor episodes and atmospheric quality from the system modeling experiences (Line 1) and the knowledge on analysis and environmental control (Line 3). New lines have been also open leading to significant improvements in analysis and calculation of management systems and waste recovery (Line 2) through the systematic use of simulation and analysis associated with the integration and intensification of processes (Line 1). Within the research activity in design and optimal operation of process systems (Line 1), innovative factors have been incorporated (environmental impact, safety, social aspects) in the objective function based on knowledge of techniques for the identification and assessment of environmental emissions (Line 3). During the design of a management and recovery of waste process(Line 2) may be necessary to introduce a network of monitoring of environmental quality (Line 3). Optimizing the number and characteristics of the sensors associated with this monitoring network could be "naturally" raised using models and calculation tools specific to the field of Line 1. The determination of the kinetics associated with oxidation of antibiotics in wastewater (Line 3) involves an optimization process (Line 1) and in turn will optimize the consumption of materials in the process (Line 1). More than 10 publications per year in higher impact journals in the areas of group-specific activity. More than 100 citations per year to the group's publications. More than 30 contributions per year presented in conferences and scientific meetings. More than 300,000 Euros per year in income from research contracts or agreements in competitive calls. More than 100,000 Euros per year in income from contracts or technology transfer agreements with private entities. An expression that refers to a wide range of industries that operate on raw material extraction, transportation and conversion into other valuable products using physical, mechanical and / or chemical methods. Average data covering the period 2005-2008.